Young Palestinians across the Occupied Territories have continued to clash with the Israeli military, while inside Israel more than 20,000 Palestinian citizens of Israel have taken to the streets to call for an end to the country’s apartheid and occupation polices. Thirty-three Palestinians are now dead, including 7 children. Thousands more are injured. As each day passes, more demand to be treated as human beings, to live free of occupation and oppression and demand justice and human rights. According to Palestinian historian Mazin Qumsiyeh, this is not the 3rd intifada; it is the 14th. Palestinian activist Jamal Juma from the Stop the Wall campaign has called it an intifada against the Bantustans: “[T]he current outbreak of protests is not solely directed at Israel. It is also a manifestation of the frustration of the people who face the brunt of Israeli aggression in the West Bank. Their protests express an overall desire to end ineffective and inept representation”. Ramzy Baroud argues that the Palestinian youth are protesting because “they experience daily humiliation and have to endure the unrelenting violence of occupation” and because “they feel a total sense of betrayal by their leadership”. The truth of their assertions can be found in the comments expressed by those on the front lines of the clashes. 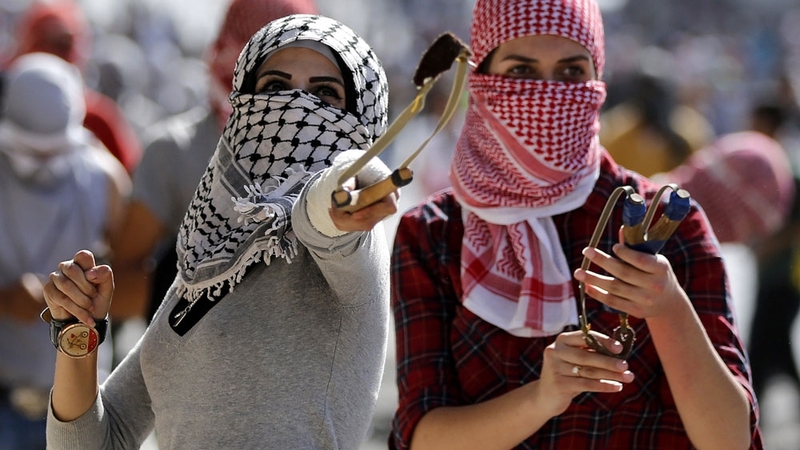 One young woman told reporters, “[the] intifada continues because we stopped listening to the president a long time ago”. Another said, “It should be up to the people to decide”, pointing out that she no longer believes in the failed peace negotiations. Yet another young Palestinian man explained to reporters that, despite most Palestinians being affiliated with one party or another, “Right now we are going to the streets against the Israeli occupation in demand of our rights, we don’t need our parties for that. 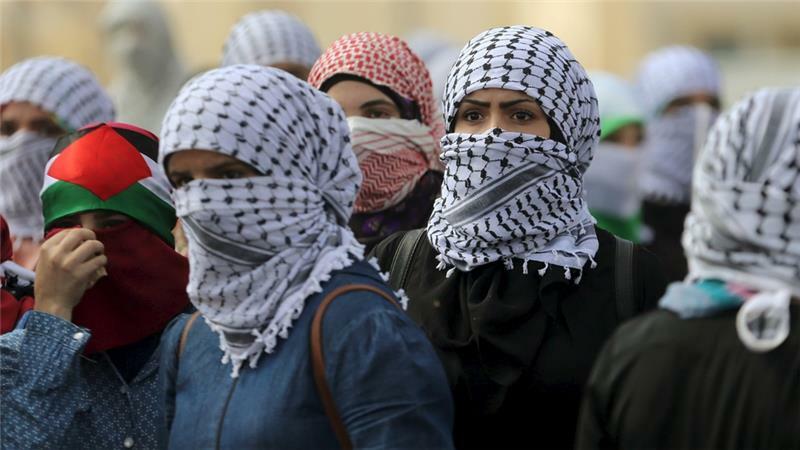 No one is talking about parties; this is an intifada from the people alone”. Once more, Palestinians have sought to take control of their lives. They are fighting to end the oppression that impacts on every aspect of their lives every single day. The Palestinian youth, both male and female, who are on the front lines throwing stones at the fourth strongest military in the world, have never known one single day when they could move freely. They have never known one single day of being able to attend school without fear that the Israeli military might fire teargas into their classrooms or invade their school yard. They have never known one single day when they did not experience the terror of night raids or the Israeli military invading their villages and their homes or the homes of their family, friends and loved ones. They have never known one single day of not having a family member, a friend or a loved one locked up in an Israeli prison. They will find it hard to remember a day when Gaza was not under blockade and siege. The young men and women on the front lines have witnessed three major attacked on Gaza in six years. They watched as more than 4,100 of their people were massacred, trapped in the largest open-air prison in the world. They watched as 800 children and young people were killed by Israeli warplanes and bombs. These young men and women have taken to the streets after weeks of Israel storming al-Aqsa mosque as part of its ongoing campaign to ethnically cleanse Occupied East Jerusalem. They have taken to the streets after they cried tears of despair and anger in July for 18-month-old Ali Dawabsheh, the baby burnt to death in Duma after Israeli colonists firebombed his home. They are on the streets because they know that those who murdered baby Ali and his parents, Saad and Reham, will never be brought to justice. They know this because Israel has made it clear that Palestinian lives are worth nothing. Israel’s defence minister Moshe Ya’alon announced: “We know who is responsible, but we will not expose those findings in order to protect our intelligence sources”. But the Palestinian youth who have taken to the streets already knew this; they have experienced it every day of their young lives. They know that the imperialist states of the US, UK and Australia – countries that continue to support Israel’s settler colonialism, war crimes and human rights abuses – also see them as “unpeople” whose lives are worth little. The Palestine youth are sick of the years of useless “peace negotiations”, which have only deepened the occupation and their oppression. They have taken to the streets because Israel is the occupier, the apartheid state, the ethnic cleanser and the oppressor. “The war did not start last Thursday, it does not start with the Jewish victims and does not end when no Jews are murdered. The Palestinians are fighting for their life, in the full sense of the word. We Israeli Jews are fighting for our privilege as a nation of masters, in the full ugliness of the term. “That we notice there’s a war on only when Jews are murdered does not cancel out the fact that Palestinians are being killed all the time, and that all the time we are doing everything in our power to make their lives unbearable. Most of the time it is a unilateral war, waged by us, to get them to say ‘yes’ to the master, thank you very much for keeping us alive in our reservations. When something in the war’s one-sidedness is disturbed, and Jews are murdered, then we pay attention. As Hass notes, the goal of Israel’s unilateral war is to force Palestinians to give up all of their national demands. The aim is to ensure that the Palestinian people will never know real statehood or real freedom from Israeli repression, oppression and apartheid. The aim is to entrench Israeli privilege forever at the expense of the Palestinians. For more than 100 years, Palestinians have remained sumoud (steadfast); they have never given up their dream of independence, nor have they given up on their homeland. They have shown time and time again that they will not buckle, no matter how strong their occupier or how weak their own leadership. They will always find the strength to resist, to demand dignity and human rights, to assert that their lives are important and to continue their just struggle for national liberation. And for the rest of us: it is our job to stand in solidarity with them. Now more than ever, it is our job to demand our governments cut ties with the apartheid state of Israel.